While trying to check the bill before settling – an old habit, inculcated by his father, of giving any bill the once-over to see that he had not been overcharged – he realised that he had lost the ability to perform the simple function of adding up the individual items and the tax that together made up the grand total. Standing at the reception desk, he tried again and again. Then he took out his wallet and tried to count the rupee and US dollar notes nestled inside; he failed. Something as fundamental to intelligence as counting was eluding him. In the peripheries of his vision he could see a small crowd gathering to look at him; discreetly, nonchalantly, they thought. The news had spread. It was then that he broke down and wept for his son. He had hesitated about taking the boy to Fatehpur Sikri right after their lunchtime tour of the Taj Mahal; two major Mughal monuments in one afternoon could be considered excessive. But, he reasoned, it was less than an hour’s drive and to fit the two sites into one day was the generally accepted practice. They could be back at their hotel in Agra by early evening and after an early night with the television and room service they could leave for Delhi, refreshed, the following morning. The reasoning prevailed. When he mentioned part of this plan to the driver of his hired car, the young man, all longish hair and golden chain around his neck and golden wristlet and chunky watch, took it as a veiled order to go about the business in record time. 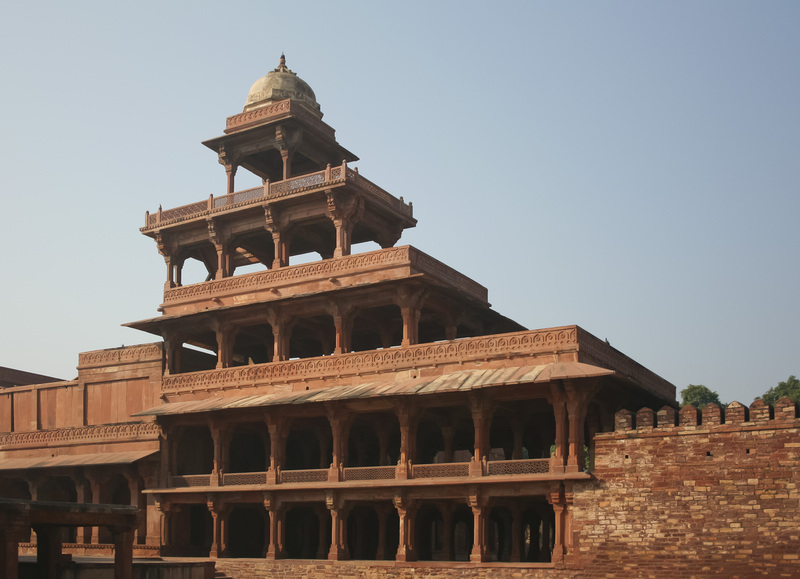 He revelled in the opportunity to drive along the dusty, cratered slip road to Fatehpur Sikri at organ-jostling speed, punctuated by abrupt jerking into rest when impeded, and launching as suddenly into motion again. They passed a string of dingy roadside eateries, tea-shops, cigarette-and-snacks shacks. The bigger ones boasted signboards and names. There were the predictable ‘Akbar’, ‘Shahjahan’, ‘Shahenshah’, a ‘Jodha Bai’, even a ‘Tansen’, which was ‘100% VAGETARIAN’. There had been a speed-warning sign earlier: ‘Batter late than never.’ Not for the first time he wondered, in a country given over to a dizzying plenitude of signs, how unsettled their orthography was. A Coca-Cola hoarding adorned the top of one small shop, the brand name and shout line written in Hindi script. ‘Coca-Cola’, the boy said, able to read that trademark universal wave even though he couldn’t read the language. ‘We can have one after we’ve done our tour,’ he said, his mind occupied by trying to work out if another order to the driver to slow down to prevent the boy from being car-sick would be taken as wilfully contradictory; he worried about these things. The boy seemed subdued; he didn’t move from the bare identification of the familiar brand to wanting it. Ordinarily, he would have been compulsively spelling out and trying to read the names written in English on shopfronts and billboards. While he was grateful for his son’s uncharacteristic placidity, he wondered if he hadn’t imposed too much on a six-year-old, dragging him from one historical monument to another. He now read a kind of polite forbearance in the boy’s quietness, a way of letting him know that this kind of tourism was wholly outside his sphere of interest but he was going to tolerate his father indulging in it. After a few questions at the Taj Mahal, which began as enthusiastic, then quickly burned out into perfunctory – ‘Baba, what is a mau-so-le-um?’, ‘Is Moom-taz under this building?’, ‘Was she walking and moving and talking when Shajjy-han built this over her?’ – they had stopped altogether. Was it wonder that had silenced him, or boredom? He had tried to keep the child interested by spinning stories that he thought would catch the boy’s imagination: ‘Do you see how white the building is? Do you know that the emperor who had it built, Shahjahan, had banquets on the terrace on full-moon nights where everything was white? The moonlight, the clothes the courtiers and the guests wore, the flowers, the food – everything was white, to go with the white of the marble and the white light of the full moon.’ The boy had nodded, seemingly absorbing the information, but had betrayed no further curiosity. Now he wondered if his son had not found all this business of tombs and immortal grief and erecting memorials to the dead macabre, unsettling. His son was American, so he was not growing up, as his father had, with the gift of ghost stories, first heard sitting on the laps of servants and aunts in his childhood home in Calcutta, then, when he was a little older, read in children’s books. As a result, he did not understand quite what went on inside the child’s head when novelties, such as the notion of an order of things created by the imagination residing under the visible world and as vivid as the real one, were introduced to him. He made a mental note to stick to historical facts only when they reached Fatehpur Sikri. He had refused to translate. He had tried to pull his son back from craning his neck, but as the queue of cars moved, and their vehicle moved forward, through a chance aperture in the hive of people around the death, he saw, for the briefest of flashes, a patch of dusty earth stained the colour of old scab from the blood it had thirstily drunk. Then the slit closed, the car started advancing inch by inch and the vision ended. He saw his son turning his head to continue to stare at the spot. But had the boy really seen the earth welt like that, or had he just imagined it? There was no way he could ask him to corroborate. Worries came stampeding in: had the child seen it? Was he going to be affected by it? How could he establish if he had, without planting the idea in the boy’s head? Excerpted from the novel A State of Freedom, with kind permission of Penguin India.